On the 7th of December, the National Park Service and "Wildlife Services" attempted to launch a dastardly sneak attack on Rock Creek Park's deer, setting up to shoot them while Monday Night Football distracted the protesters. It didn't work. 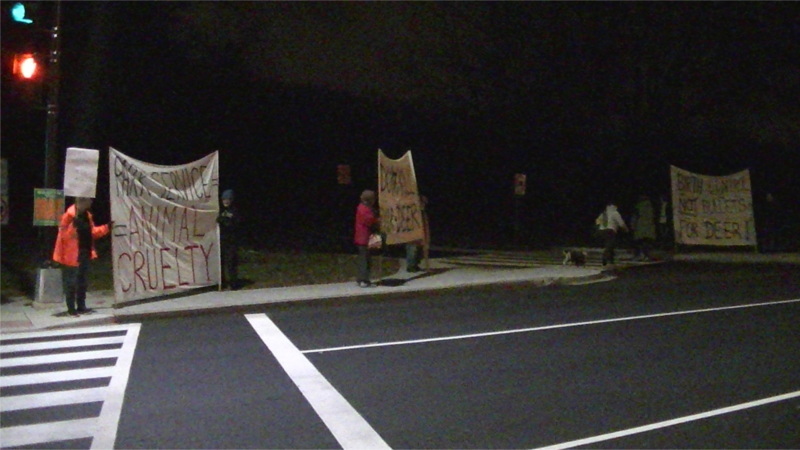 Activists patrolling the woods found NPS setting up at about 7PM and announced plans for a 10PM protest. By 9:30PM closed roads had been reopened and it appeared the deer shoot had been cancelled for the night. Protesters set up anyway, standing alert against them trying to set back up. About halfway through the protest, a man in a Chevy Corvette became very abusive while debating protesters, and indicated he would return to run down the elders holding the banner on that side of Military Road. Police were summoned and he did not show. It appears that "Wildlife Services" is very reluctant to shoot deer when protesters wielding cameras control that intersection. Just in case, whistles and cowbells were also on hand. A January 2014 confrontation featured a failed attempt by US Park Police to force protesters to move from the intersection of Military Road and Oregon Ave so trucks with dead deer in the back could use the intersection without being photographed. Protesters refused to move and stood their ground, and that night of killing ended shortly therafter. One of the places they usually kill deer is between Oregon Ave and Beach Drive, they cannot shoot there until Beach Drive is closed. They do not close Beach Drive until 9:30PM on a kill night, so as to minimuze impact on rush hour traffic. Although some smaller park roads were closed at 7PM both north and south of Military Road, all were reopened by about 9:30PM. NPS trucks continued to circulate, but further patrols after protesters left shortly before midnight found the community garden barricades removed and roads still open. Protesters will remain alert against efforts to kill deer on a later night, Tuesday December 8 receiving special attention in case of a quick effort to try again. Still, activists patrol the park nearly every night.